We have catered to all the major global Wind mill clients. We have built an indispensable position in the industry by manufacturing, importing, exporting, trading and supplying a commendable range of Wind Tower Circular Seam Welding Equipment. Offered products are appreciated in the market due to its high strength & quality. These products are designed with advance techniques and finest material keeping in mind the set norms. Our products are checked on numerous parameters in order to deliver a perfect range. Customers can avail these products from us in different specifications as per their desires. 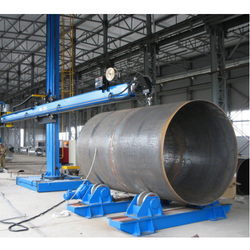 Looking for Wind Tower Welding ?